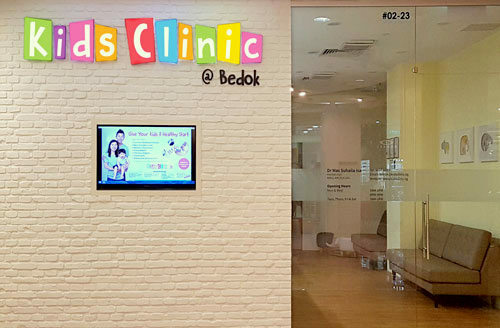 Kids Clinic has a network of five locations in Singapore, one of which is within Bedok Point Mall (799 New Upper Changi Road). Kids Clinic, owned by Singapore Medical Group (incorporated in 2005), has paediatric specialists who are trained to meet a child’s health needs as they grow from newborns to toddlers. Among the General Paediatric Services offered at the Kids Clinics are acute illness consultation and medical care, baby growth & development, basic emergency care, common childhood ailments, developmental assessment, immunisation, infectious diseases, newborn examinations, as well as travel health. Specialised Paediatric Services at the clinics, meanwhile, include Complex Infectious Diseases (such as tuberculosis, Lyme disease, and Chikungunya), Neonatalogy, and Paediatric Plastic Surgery (birthmarks, cleft and craniofacial conditions, ear molding (earwell), ear reconstruction, otoplasty, burn injuries, facial fractures, lacerations, scars, moles and lumps). The official Kids Clinic Singapore Facebook page is located at www.facebook.com/kidsclinicsg/. Kids Clinic SG also has an official Instagram account available at www.instagram.com/kidsclinicsg/.